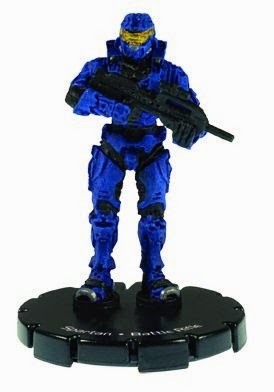 From the beginning I had in mind the Halo Actionclix miniatures to use in my Halo Tactics games, wherever there is a problem with the Actionclix minis: the base. Wizkids miniatures (both Actionclix and Heroclix) use 40 mm bases for ALL their minis. You can work with this in your games (in my first test games I play with the minis like that without problem), but having different sizes for the bases will improve the game in many ways, the first is that the miniatures will reflect more their size and control area, helping to improve the tactical aspects of the game. Now that I have my Halo Actionclix miniatures to use in my Halo Tactics games is time for convert the minis to a proper base, for this I want to use a technique that I saw in the Bell of the lost souls. Using cork I give texture to the bases to make them interesting and looking like concrete (for a urban conflict in my halo games). Each square was then cut and given a proper appearance, to look like broken concrete. After a layer of base black paint (in this case I use chaos black spray from citadel), I paint each base with dark grey, follow of a dry brush of grey and final lights with a little of white paint. 20 mm bases: Marines, ODST, Spartan, Drones, Grounts, Jackals. 40 mm Bases: Elite, Brutes.